Since the 1980s, personal computers have been moving into our lives (and taking over?). Operating systems became a necessity to manage both hardware and software, as well as provide us with easy-to-use graphical interfaces. But where did they come from? To answer that question, I worked up a brief history of the three most prominent players in the game. In 1975, Bill Gates and Paul Allen started a company called Microsoft, which in 1981 released the MS‑DOS operating system. The first graphical user interface (GUI) Microsoft product, Windows 1.0, was released in 1985. Over the course of the next 15 years, Windows 2.0, Windows/386, Windows 3.0, Windows 3.1, Windows NT, Windows 95 and Windows 98 were all released, still based on the original MS-DOS, but with improved GUI features with each release. Next on the scene was Windows XP (in 2001), followed by Windows Vista (in 2006), Windows 7 (in 2009) and Windows 8 (in 2012). The next version, Windows 10, is scheduled for release in mid-2015. In 2014, Windows 7 held about 58% of the PC operating system market share, while Microsoft as a whole held about 91.02%. The Linux core, or “kernel”, was developed in 1991 by a Finnish computer science student named Linus Torvalds. It was based on an operating system called Minix (which was a mini version of Unix). In late 1992, the Linux kernel was released under the GNU General Public License as an open source (free) operating system. In 1996, a penguin named “Tux” became the official Linux mascot. Today there are thousands of contributors developing Linux kernel, with Linus Torvalds acting as coordinator and supervisor. 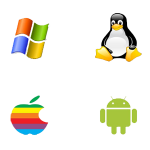 There are hundreds of Linux distributions (packages of software based on the original kernel) available. In 2014, Linux held about 1.5% of the PC operating system market share. Often confused with MAC (which is actually a computer and not an operating system), OS X is the name of an operating system first released in 1999 by Apple Inc., to run on Macintosh computers. Of note, is the fact that OS X is pronounced “oh es ten”, as the X stands for the roman numeral ten. OS X follows the 1996 Apple release of MAC OS, preceded by System in 1964. In 2014, OS X held about 7.28% of the PC operating system market share. Operating systems have been around much longer than I have! As I have no experience with OS X, my focus will be on both Windows (currently version 7) and Linux (Fedora with KDE). Next week I’ll be talking about why I use both, somewhat interchangeably.